Full-length sequence information is essential for studying the integrity and correct translation of biopharmaceuticals. In general, protein sequence analysis service provided by MtoZ Biolabs includes three steps: digestion of proteins into smaller peptide fragments; tandem LC-MS/MS analysis of peptides; MS/MS data analysis. Traditional protein sequencing only uses trypsin for digestion, which renders the final protein sequence coverage of around 60%. To ensure 100% protein sequence coverage, MtoZ Biolabs uses up to 6 kinds of protein enzymes for protein digestions, eliminating any missing peptides. In this project, we analyzed the full-length sequence of an antibody product sent from one of our customers. To ensure 100% sequence coverage, we selected 4 enzymes for protein digestion, based on the predicted antibody sequence. 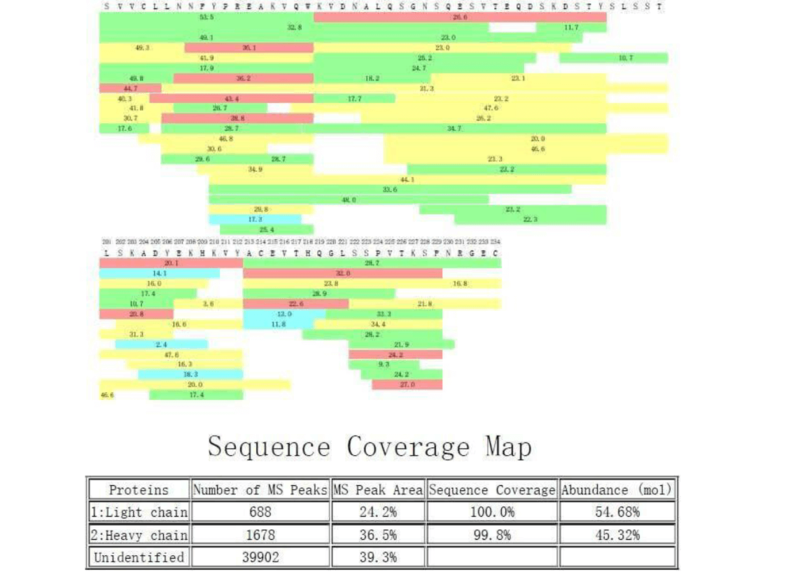 The sequence mapping results showed 100% sequence coverage.